Recent studies of Heidegger's involvement with National Socialism have often presented Heidegger's philosophy as a forerunner to his political involvement. This has occured often to the detriment of the highly complex nature of Heidegger's relation to the political. Heidegger and the Political redresses this imbalance and is one of the first books to critically assess Heidegger's relation to politics and his conception of the political. 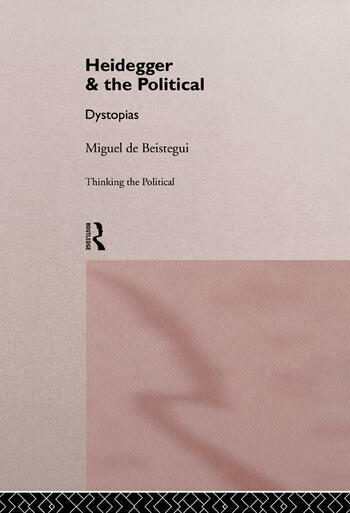 Miguel de Beistegui shows how we must question why the political is so often displaced in Heidegger's writings rather than read the political into Heidegger. Exploring Heidegger's ontology where politics takes place after a forgetting of Being and his wish to think a site more originary and primordial than politics, Heidegger and the Political considers what some of Heidegger's key motifs - his emphasis on lost origins, his discussions of Holderlin's poetry, his writing on technology and the ancient Greek polis - may tell us about Heidegger's relation to the political. Miguel de Beistegui also engages with the very risks implicit in Heidegger's denial of the political and how this opens up the question of the risk of thinking itself. Heidegger and the Political is essential reading for students of philosophy and politics and all those interested in the question of the political today.